Moving from Awareness to Action - I Love ABA! I recently had a conversation with one of my clients about Autism Awareness month. While its not quite April yet, during the month of April it's common to see banners, poignant commercial spots with sad music, print ads, blue light-bulbs, parades, etc., all focused on spreading awareness of Autism. Across the country, people join together to help spread the word about Autism. My client asked me a question about Autism Awareness month that struck a chord with me, and prompted me to write this post. Awareness and information are important…absolutely. Awareness of the impact Autism can have on an entire family, not just the individual who actually has Autism, is a necessary 1st step. But after that 1st step, then what? Did you spend last April making your church, co-workers, or neighbors aware of Autism? What impact did that have on your life once the month of April was over? What I would love to see, is a focus on action in the month of April. So many of the families I work with are super non-impressed with the Autism walks, telethons, and celebrity endorsements of various Autism therapies. They tell me “Tameika I’d love to go downtown and wear a t-shirt for the Autism march, but I’m too busy teaching my child with Autism to stop breaking all their toys”. So my small part to add to this conversation is a list of simple action strategies that anyone can implement to improve the life of a family living with Autism. Maybe you feel you don’t know where to start, or this is too big of an issue for you to tackle. Okay, so then do something that helps 1 family. Greet individuals with Autism out in the community: I know, you can’t know for certain who has Autism and who does not. But if you are a parent or professional and you see the tell-tale tip-toe walking, hand flapping, or echolalia being exhibited by an individual in front of you at the grocery store, take some time to deliver a smile, wave, or greeting. Make eye contact with the parents and ask a simple question such as “How is your day going?”. Parents of children with special needs often experience no attention in public, as people politely avert their gaze and look down, or they experience excessive attention, as everyone turns to stare at their child’s behaviors. Just a simple friendly interaction could go a long way for that individual with Autism, or their parent. Offer free services to a family living with Autism: Offer to babysit the kids for an evening, so mom and dad can catch a movie….or offer to cut their lawn…..or do their laundry……or cook dinner…….or (and here’s a big one) invite the individual with Autism out without the parents present. Do you know for some families, no one ever invites their child with Autism out to do things? Yes, some parents may feel uncomfortable letting their child go to a movie or to Six Flags without them present. But some parents would LOVE if a family friend or relative invited their child somewhere, and mom and dad are not implicitly expected to go and play chaperone. If you own a business, pursue Diversity Training on special needs: Whether you own an ice cream parlor, shoe store, or a pet cleaning business, does your staff know how to respect the dignity of individuals with special needs? If a parent walked into your business with a withdrawn and quiet teen who suddenly bounced on his heels and shrieked loudly, would that parent be asked to leave? Would the staff make that family feel welcome? Or whisper and stare at that family? Most of the families I work with are incredibly loyal to the businesses in their neighborhood that “get it”. Don’t let your business be a place where families living with Autism feel disrespected or unwanted. 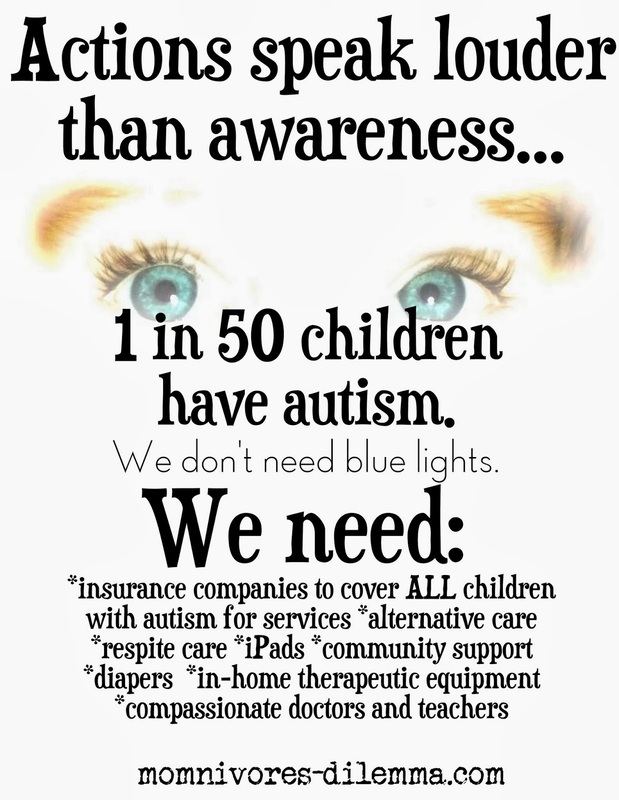 Instead of lighting something up blue, consider supporting a cause: It’s great to show your support of Autism Awareness month, but once April is over, families will still need quality treatment for their kiddos. Consider making a donation to an Autism research website, or start locally: call a school in your city and ask what donation you can make to the Special Education department. You can also donate your time. Volunteer at a respite facility, or visit group homes and play your guitar for the individuals who live there. And speaking of volunteering……. Volunteer to serve in the special needs ministry at your church: If you work with children with Autism, think of a few of the kids you help. Now picture them sitting through a church service. How do you think their parents handle it? Well, in many cases they don’t. Often the child has behavioral issues that make attending church difficult or embarrassing, so the family just doesn’t go. Or the volunteers, even in the special needs room, can’t handle their child so the family just doesn't take their child to church. If you work with children with Autism for a living, you are full of knowledge and information that many of the other volunteers might not have. Helping the church implement structure, visuals, and reinforcement into the special needs ministry could make all the difference in the world.